Ari will be in Oxford on December 7th with the fine folks at City Grocery who’ll be cooking up some of their favorites from the Guide to Better Bacon. And hold on to your forks, Asheville! We’re headed to Laurey’s on January 4th to have some yummy fun–just in time for your New Year’s resolution to eat more bacon. A while back, one of our illustrators came over to do a photo shoot for Ari’s guest blog on The Atlantic’s site. Ari was writing about the dish we’d done for Zingerman’s Guide to Better Bacon, and we needed a photo. “Perfect opportunity to have a yummy lunch!” I’d remarked. I set to simmering, frying, and sizzling. Ryan set to framing and focusing, and captured it perfectly. (You can check out his lovely photo on the blog–I’ll include my amateur shot here.) We dove in. I think I’ll be cooking this one up again soon. This is a simple preparation, it has a great name, it’s pretty eye-catching on the plate and, most importantly, it tastes extremely terrifically good. I made it with the really superb, organic, stone-ground blue grits that we get from Glenn Roberts’ Anson Mills in South Carolina. Given that the old corn varieties ranged in color from white to red to yellow to blue and most everything in between (or even all on one cob–try Glenn’s multi-colored “speckled grits” too! ), blue grits really aren’t all that strange. It’ll mess up your all-blue color scheme, but this is also good with cooked greens on the side. To get back into the blue end of the spectrum you can follow with fresh blueberries and a dollop of fresh whipped cream (no bacon) for dessert! Serves 2 as a main course. Since the cooking time is the most challenging element of this recipe, feel free to prepare a larger portion than you actually need and save some for later. Heat the water in a heavy four-quart stockpot. Start mixing in the grits while the water warms up, stirring regularly–I find it infinitely easier to get lump-free grits this way. Add salt and stir well. Bring to a boil, then reduce the heat as low as possible. Stir a few more times, cover and cook on low for as long as you can–a good 2 to 4 hours–the long, slow cooking releases the starches and makes the grits really creamy. Once you get them cooking there’s really nothing to do but stir every 15 minutes or so. When the grits are good and creamy and you’re ready to eat, you can start the fish. 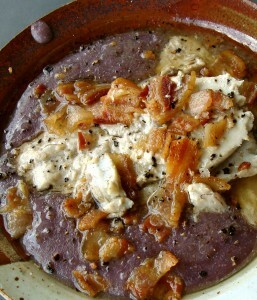 • Extra virgin olive oil (optional) Fry the bacon in a heavy-bottomed skillet over moderate heat. Remove the bacon from the pan and drain, leaving the fat in the pan. Add the fish to the still-hot bacon fat in the skillet, skin side down (I think the skin is the best part!). Cook the fish until the skin is browned, then flip and cook quickly on the other side. If you need more fat, add a glug from your reserves or use a bit of olive oil. When the fish is almost done, set the grits into a couple of warm bowls. Place the fish on top, skin side down. Sprinkle the fat over the whole thing and top with salt, pepper, and chopped bacon. Join Ari on November 10th at 7:30 at the Jewish Community Center in Ann Arbor for a discussion of our newest book, A Lapsed Anarchist’s Approach to Building a Great Business.